Last year marked the 60th anniversary of the outbreak of the Korean War, but whatever commemorations occurred were pretty low key, maintaining its reputation as “the forgotten war.” Given that many people at the time saw the war as possibly leading to World War III, it’s interesting that it’s receded so much from public consciousness. Sometimes it’s the byways of history that tell us the most about how things really were. 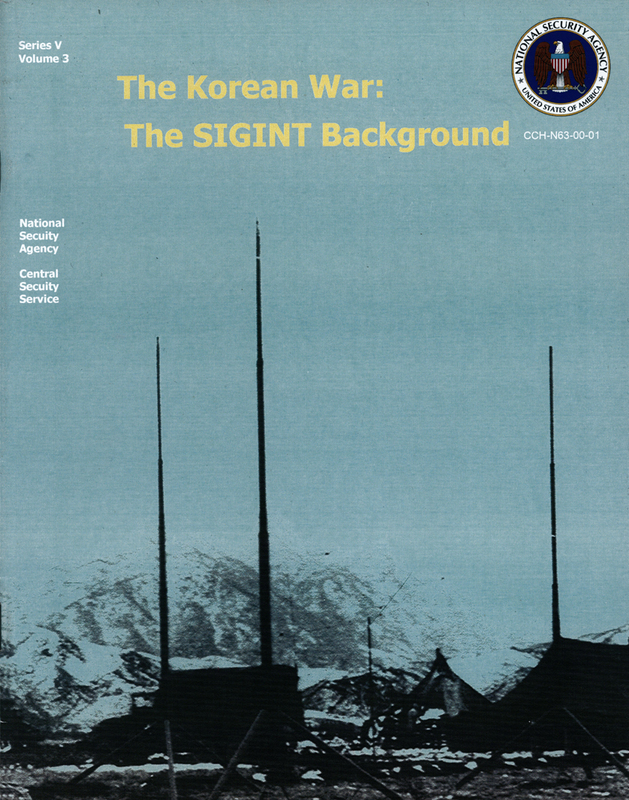 Two pamphlets produced by the National Security Agency’s Center for Cryptologic History on signals intelligence (SIGINT) in the Korean War do just that. The Korean War: the SIGINT Background shows how woefully understaffed and under-skilled the Armed Forces Security Agency (AFSA) was in the run-up to war. With most of its efforts focused on the Soviet Union and the People’s Republic of China, AFSA had neither the motivation nor the Korean language capabilities to track North Korean communications. The betrayal of American penetration of Soviet cipher systems by an NKVD mole in AFSA resulted in even more distraction. 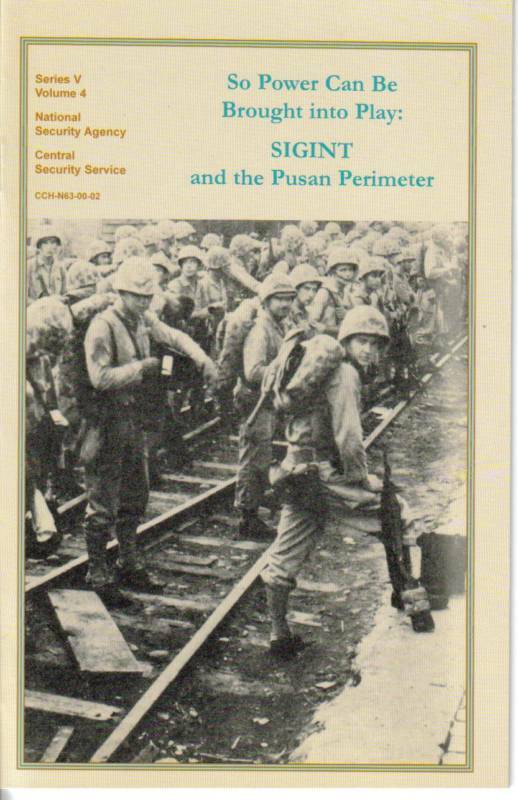 So Power Can be Brought into Play: SIGINT and the Pusan Perimeter takes the story into combat. While recapitulating the failings of AFSA prior to the outbreak of war, it describes how quickly its staff began providing high-quality intelligence to the U.S. forces trapped in the Pusan perimeter after the massive North Korean invasion that pushed them into that pocket southeast of Seoul. Although outnumbered and outgunned, American forces held out until the risky but totally successful amphibious invasion at Inchon. The Korean War: the SIGINT Background then outlines the Chinese phase of the war, the resultant stalemate, and the detailed advance intelligence that led to victories at Hill 395 and Pork Chop Hill prior to the 1953 armistice. So there is the Korean War in microcosm: initial surprise and near-disaster, furious improvisation, and success followed by stalemate and an indecisive finish. Perhaps that’s why we don’t remember it – hard fighting but no parades. You can read these publications or order copies here or find them in a library. This entry was posted on Friday, January 14th, 2011 at 1:37 pm and is filed under National Security Agency. You can follow any responses to this entry through the RSS 2.0 feed. You can leave a response, or trackback from your own site. The Rift between both is often misunderstood and usually does not get taken care of. If the rift can be taken care of this is the most beneficial of all. Thanks for your thoughts, If a record of America’s “forgotten” wars have been compiled, the War of 1812 would unquestionably rank in the vicinity of the very best. Thumb too easily due to any United States background ebook, and you might be doubtless to skip correct earlier the scant several pages generally devoted to this conflict. Ich finde es gut das sie immer wieder gute angebote machen!!! There is more to the stupidity than what is mentioned above. The Korean “war” was a U.N. action. Everything done was run through the U.N. Security Council for approval. Who sat on the U.N. Security Council at that time? The USSR was one of the members. That meant that all plans for prosecution of the “U.N. war” was revealed to the Soviets who were backers and combat participants in the “war”. Should it be any surprise that the U.N. forces were not to successful until McArthur realized that he had to keep his plans secret from his own government. Hence the successful surprise attack at Inchon and the subsequent successful march back up the Korean Peninsula. As long as McArthur kept his own government out of the loop, he could make plans that would succeed. Tell his government, his government told the U.N. Security council and the Soviets told the North Koreans. What do you think was at the bottom of the rift that developed between Truman and McArthur? My Dad served 25 years in the Navy of his life and my Mom served 5 years in the Navy of her life too. Also my brothers served in the Navy. It has made me have more respect for the men and women that are serving the Military. I honor them with everything that I have. They are our #1 Heroes here. I am looking for an Arnold Perkins who was married to a Christina. Is he related. I grew up with Christina and found out a few years ago that she had died and wanted to know what had happened. This war was a total mistake. Sec. of State Dean Acheseon in a talk to the National Press Corp. in Jan. 1950 made the second mistake.Truman and MacArthur (two of the biggest buffons in this Country’s history) made the first by agreeing to allow Russia to become involved and let them disarm and take prisoner all Japanese troops north of the 38th parallel at the end of WWII in 1945. This resulted in a divided Korea and a war just five years later. 40,000 +/- of America’s young men paid the price for that debacle. THE COLDEST WINTER; by DAVID HALBERSTAM is the best book written so far about that terrible time. 40.000 personas que merecen el honor de hacer respetar la democracia en Corea del Sur.No me gustan las novelas. Like a scholars gemstone found in a dusty old library shelf in the basement racks of dissertation files, this tome will finds its best fit on the lecturn a few floors up in classroom of eager future Foreign Service Officers. ACCORDING TO THE HISTORY , THE ARMED FORCES SECURITY AGENCY WAS WOEFULLY UNDERSTAFFED AND UNDER-SKILLED IN THE RUN-UP TO THE KOREAN WAR!ACTUALLY THIS IS TRUE!AS I SAID TWO OR THREE WEΕKS , “NEVER MISTAKE IN ANY WAR”!ON THE OTHER HAND , IT SHOULD BE NOTED THAT , THE AMERICAN FORCES LEARN FROM THEIR MISTAKES , IN ANY WAR!AND OF COURSE , AMERICAN FORCES IMPROVES THEIR CAPABILITIES!